SLAM DUNK TO THE BEACH IS BACK! It took 11 years, but Slam Dunk to the Beach is back. The annual high school basketball showcase returned to Cape Henlopen High School on Saturday for the first time since 2003. In Day One’s opening session Lake Clifton (MD) beat Caesar Rodney (DE), 60-43, Christ The King (NY) topped Gonzaga College High School (DC) 63-51, in a battle of nationally ranked foes and St. Georges (DE) defeated Cape Henlopen (DE) 49-41. Lake Clifton provided quite the opening salvo for the event. Herman Harried’s team scored the game’s first nine points and held Caesar Rodney without a field goal in the opening quarter on the way to an 18-4 edge. That lead would extend to as large as 19 before the Riders finally found their footing. C.R. put together a 13-3 run of their own, which culminated on Jameir Sudler’s corner-three, bringing Caesar Rodney back to within single digits 1:15 before intermission. But Lake Clifton would get the final basket of the half and then carried that momentum over to the third quarter, which it opened on an 11-4 spurt. Caesar Rodney would get as close as 10 late in the third period, thanks in large part to a pair of tough finishes by reserve Kashwon Davis. But Davis would pick up his fourth foul on the ensuing possession, which propelled the Lakers on a 14-2 stretch, ending the game’s competitive phase. Garry Jefferson played a magnificent game for Lake Clifton, needing only 10 shots to lead all scorers with 21 points. He also earned nine trips to the foul line and plenty of praise from his head coach. Caesar Rodney got 13 points from Jaquan Hooks as well as 12 points and eight boards from Tristan Patterson. The opener served as a pretty good appetizer for a main course that featured the Nos. 5 and 23 teams in the nation. 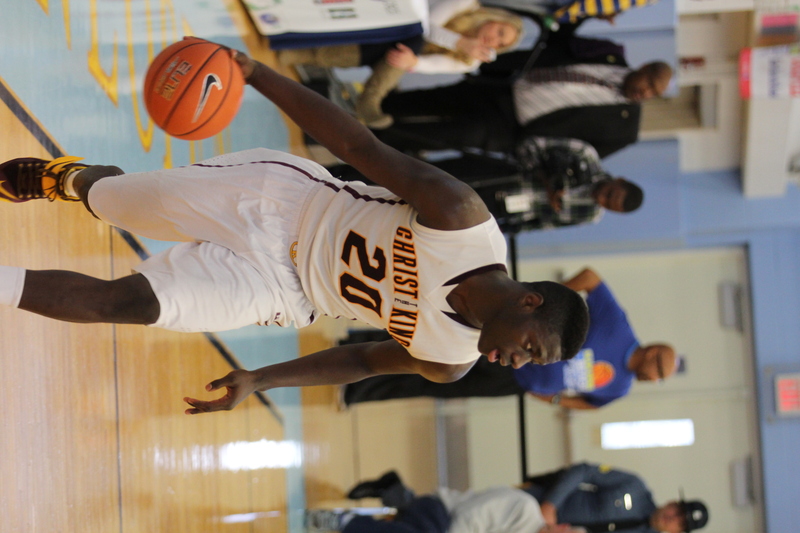 Christ The King pulled off the upset thanks in large part to its defense, which held Gonzaga to 37 percent shooting from the floor and only 17 percent from beyond the arc. It was actually Gonzaga’s defense that was stifling early. The Eagles held Christ The King to only three field goals in the opening period on the way to a 16-8 advantage after one quarter. 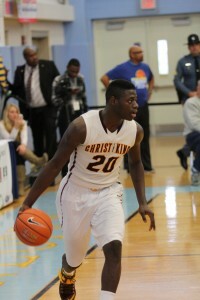 That lead was trimmed to 28-25 at the half thanks in large part to Rawle Alkins, who had nine points, six rebounds and three blocks before the break. His presence only intensified in the second half. The 35th-ranked junior in the country, according to ESPN.com, finished the day with 18 points and 18 rebounds. His dominance on the glass turned Gonzaga into a one-and-done offense and his three second-half steals helped get Christ The King out in transition. Meanwhile, Gonzaga’s best player endured a tough shooting day. Bryant Crawford, the Wake Forest commit and 16th-ranked point guard in the class of 2015 according to ESPN.com, missed 11 of his 14 shots from the field, and was held to just eight points for the game. Christ The King did not do everything right. The Royals won despite committing 26 turnovers. Arbitello, who also appeared in Slam Dunk to the Beach as a player in 1994, was imploring his team to remain calm, providing a perspective that aided his cause. A dominant second half was the story of the opening session’s finale. Despite taking a 24-16 deficit into intermission, St. Georges won going away by holding Cape Henlopen to just four third-quarter points. St. Georges got a game-high 20 points from Kyson Rawls. His four steals were a big part of the 23 turnovers the Seahawks forced for the game. Those takeaways led directly to 21 points and were the difference in the contest. Slam Dunk to the Beach continues on Saturday night, as the second session will feature three premiere matchups. Gill St. Bernard’s (NJ) and Ss. Neumann-Goretti will get the evening started at 6 p.m. Then Midwestern power Sunrise Christian (KS) squares off with Mount St. Joseph (MD) at 7:30 p.m., followed by a First State showdown as Sanford and Salesianum do battle in the nightcap at 9 p.m.
“I have been challenging Gary Jefferson a lot to have games like he did today. He flat out brought it. And you know what? I’ll be challenging him as soon as we get back on the bus to do it again. I’m demanding and he certainly responded like we were hoping he would. I’m excited [Slam Dunk to the Beach] is back. At one time it was one of the best events nationally, and I know with the group of people that’s running it now, it’ll get it back there. Plus, I think once more people realize it’s back again, everybody will want to attend. Yeah, it’s going to be back in no time.